Stash Karandanis, cofounder of Tackle Grab, sorted through an array of tackle before casting his line. When he saw his former girlfriend receiving boxes of beauty samples through a monthly online subscription service, Boston entrepreneur Stash Karandanis was inspired to do the same for anglers. Last year he launched the e-commerce firm Tackle Grab of East Sandwich, shipping jigs, lures, plugs, and flies, customized to an angler’s profile. 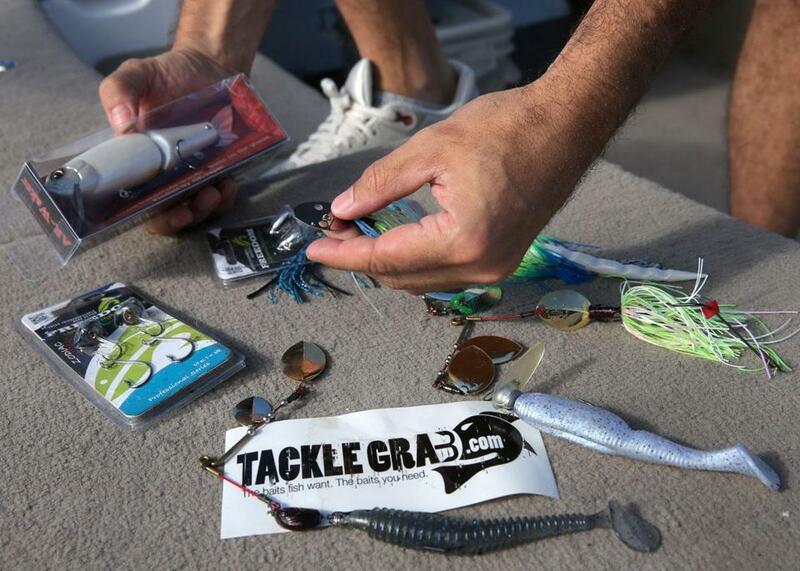 So what’s in the Tackle Grab goodie box this month? It depends on your “Angler Profile,” an online survey that collects personalized fishing data. Every month, starting at about $15 and up, members receive three samples of tackle suited to their fishing style. We work with major brands. Do fishermen really pay attention to brands? Fishing is all about discovery, and anglers are always up for experimenting, whether it’s testing a new body of water or trying a new technique. The sport is also changing. Women represent a quarter of all anglers in the country, and historically women spend more on hobbies than men. Tackle Grab uses social media, including Facebook, Twitter, and YouTube, to reach potential members. But there’s the image of a fisherman as being a neo-Luddite Joe Six-Pack. Fishing has been a very social sport, and now anglers are talking online about new baits or techniques as well as bragging about their big catch. A young demographic has come into the sport. Kids are joining fishing leagues and competing in tournaments. Do fish really care about the type of tackle used? Fish are very specific in their type of predation, depending on the time of year and body of water. It’s up to the angler to know what fish are keying on. What tips would you give to the beginner fisherman? The most important thing to learn is basic technique — how to properly fish topwater, or on the water’s surface. Remember you can never fish too slow; don’t be afraid to take your time fishing. Spend time on the water. What lies ahead for anglers with climate change? Climate change is a real issue. It’s there, and we are seeing it. More species are moving farther north, and bodies of water are drying out because of drought. I don’t know how this will affect angling, but in many regions, things are not going to be the same. What was the last fish that you caught? I live on Cape Cod. The last fish I caught was off a beach in Barnstable — a 20-pound striper using an AR lure.